TGIF! It’s almost Friday and that means pizza night around the Grandy house! Get out your cast iron skillet and let’s cook us up some PIZZA! Let’s just backtrack here, you’re asking me if I said cast iron skillet, right? Why yes I did, you are going to cook this pizza in a cast iron skillet. This is me telling you to go out and purchase yourself a cast iron skillet. You don’t need to get a fancy name brand one like Le Creuset (those cost $150 and up). Pick up a Lodge Logic. The 12-inch skillet is only $29 and the 10-inch is only $20. Here is a link to Sur La Table where you can check out the pricing and features. Lodge Logic is the traditional cast iron pan that your grandmother had. These pans rock and I am cooking everything in my cast iron skillet lately from breads & pizzas to meats. Lets get back to this pizza. This pizza is family and kid approved, I mean like totally! The bottom of the pizza and the crust gets all brown and crispy from cooking in the cast iron pan, the sausage adds a bit of spiciness to the pizza and the homemade sauce is amazing and so fresh tasting. I am actually going to use this pizza sauce recipe going forward because it’s so easy and so DELISH! We honestly felt like we were eating at a fancy pizzeria. The best part of baking the pizza in the cast iron skillet was that I did not have to roll out any dough! I always hated that part. Note: Most store bought pizza dough’s are 1 pound. You can use the whole pound of pizza dough; I did the first time I made this pizza. It will be a thicker pizza in general, but it will still taste great. I used 3/4 pound the next time I made the pizza and it was a bit thinner and less doughy in spots, which I preferred. 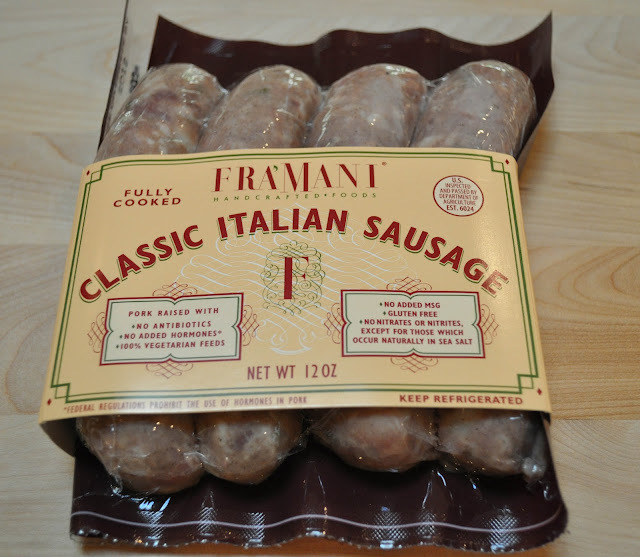 I used these classic Italian sausages. 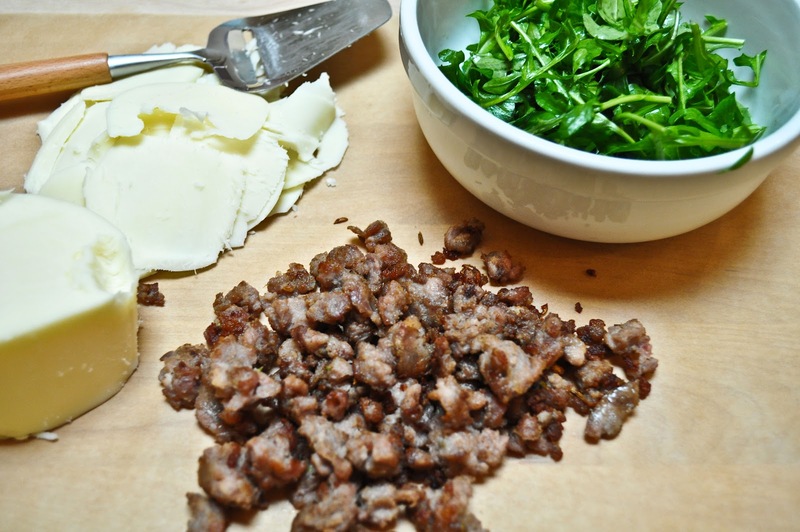 You can honestly use any type of Italian sausages. These were great as they are nitrate free, raised without antibiotics and with no added hormones. They were also fully cooked so all I had to do was heat up the meat after I took the meat out of it’s casing. 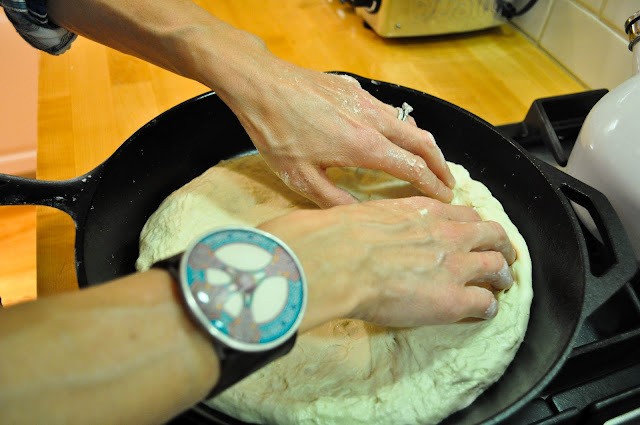 John thought it was cool to take an overhead shot of me pressing the dough. He was aiming the camera in all sorts of directions. I think this shot below came out sort of cool! Slide the pizza out of the cast iron skillet onto a cutting board. Folks, I have had this cast iron pan for 2 months now and it’s virtually non-stick. My pizza slid right out of the pan when I tipped it to the side, so don’t fret about your crust sticking to the bottom of the pan. Cut into individual slices and serve up with a fresh tossed salad or vegetable of your choice. 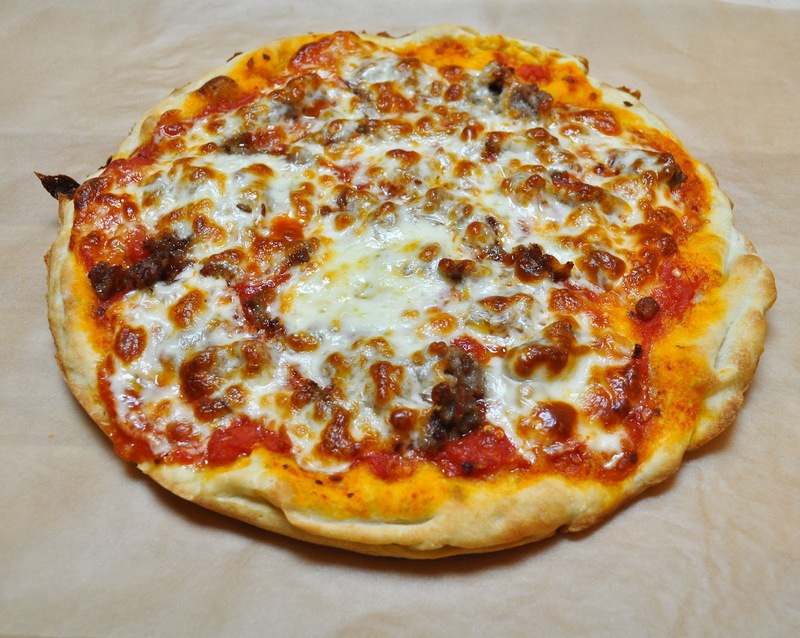 We liked this pizza so much that my kid’s requested I make it again the next day for lunch! Needless to say, it was devoured! If you like skillet pizzas then try my deep-dish pepperoni skillet pizza. Note: Most store bought pizza dough's are 1 pound. You can use the whole pound of pizza dough; I did the first time I made this pizza. It will be a thicker pizza in general, but it will still taste great. 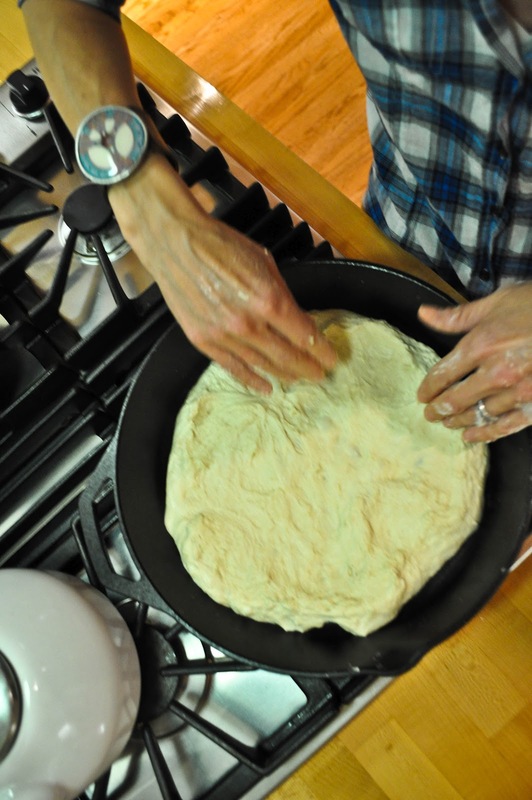 I used ¾ pound the next time I made the pizza and it was a bit thinner and less doughy in spots, which I preferred. Remove sausages from their casings. All you have to do to remove the sausage from it's casing is to cut a slit down the length of the sausage and then peel it open and remove the sausage. You are going to literally push and tear it out of it's casing. You might have some casing left on the sausage, but it doesn't matter. 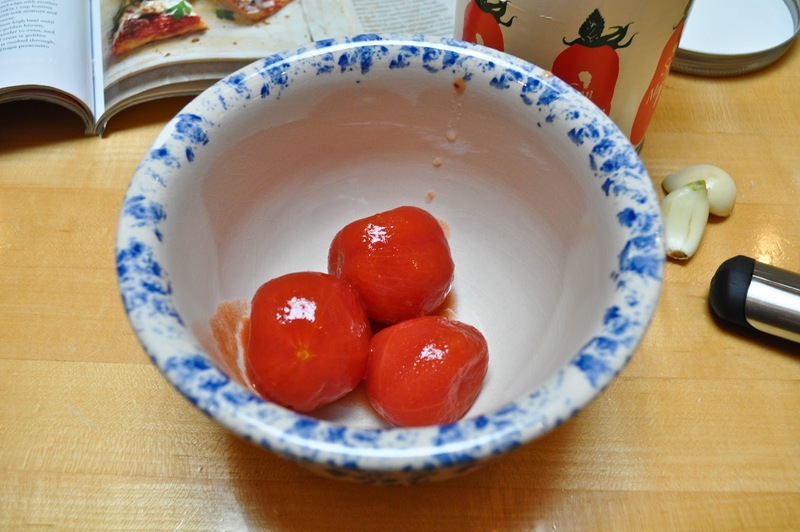 Crush the tomatoes with a fork and your fingers if needed. Don't be afraid to get your hands messy. 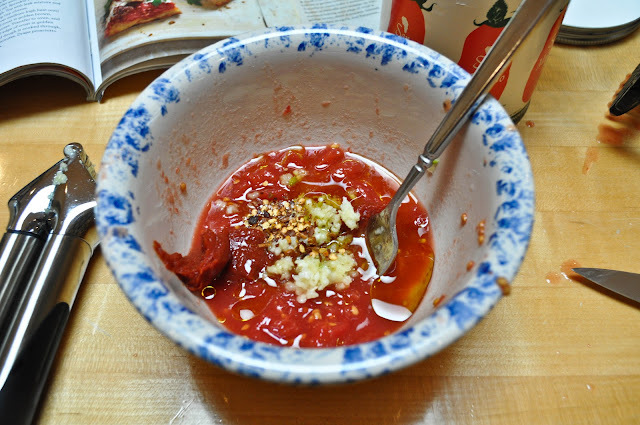 Add the 1 tablespoon tomato paste, 2 minced garlic cloves, 1-tablespoon olive oil, ¼-teaspoon salt and ¼ teaspoon red pepper flakes to the crushed tomatoes, mix them all together. Slide the pizza out of the cast iron skillet onto a cutting board. Folks, I have had this cast iron pan for 2 months now and it's virtually non-stick. My pizza slid right out of the pan when I tipped it to the side, so don't fret about your crust sticking to the bottom of the pan. I’m pretty much obsessed with this pizza, we make it a lot! 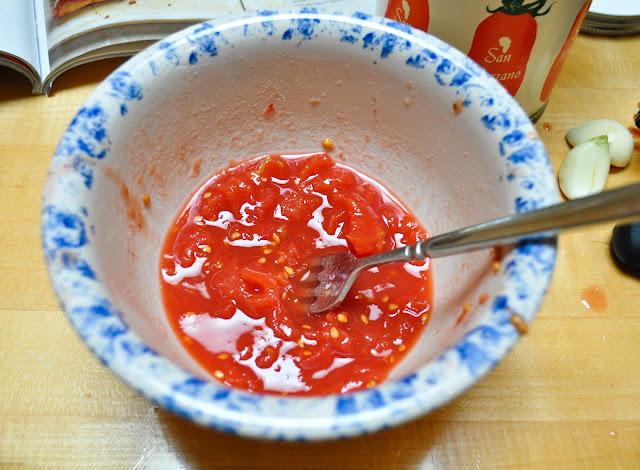 I use my mom’s canned sauce, but once we run out ill try it your way. It’s so fun to make it in the cast iron! It has come out perfectly every time! I found this post a while back and I’ve used this method several times, and the pizza always comes out GREAT! I’ve tried many methods for making pizza and this one is by far the best, the texture of the crust is just fantastic. Just wanted to say thanks! Hi Allyson. Here are some tips that I do to keep my cast iron in tip-top shape. While the pan is warm, I rinse it out under hot running water, and scrub the pan with a brush to remove traces of food. NEVER clean your pan with soap, as that will ruin the pan. After I rinse the pan, I put it back on the burner over low heat until all traces of moisture disappear. I then put a few drops of oil in the pan (when it’s dry & still warm) and rub it in with a paper towel until all the oil is soaked into the pan. Keep wiping the pan (you can even use a fresh paper towel) till all the oil is rubbed into the pan, as you don’t want the pan to feel oily to the touch. I hope the above steps help you! Let me know if it works! I’ve never made pizza in a skillet, but this looks like such a great and delicious idea! Thanks Elizabeth. You should try it sometime if you have a skillet. It’s super easy and the crust gets oh so crispy! I can’t wait to try this one Jacquelyn! I love the addition of the arugula. I LOVE my lodge cast iron skillets. Can’t believe I waited so long to pick one up. I also like cooking pizza in a skillet. This one looks delicious! YUMMM!!! Pizza is pretty much my top favourite food in the world (apart from sushi, and maybe enchiladas… oh and eggs benedict!). Ive heard about this cast iron skillet tool for baking it – but never had much faith. Youve definitely inspired me to give it a try (and to maybe make Louis buy us one in the States!). I love crispy pizza bases so much! ALSO love fresh salad on pizza – I put cold tomatoes & basil on top and adore it! Hi Em! The book is waaaay better than the movie so you will enjoy. Kindle is the way to go. I have it on my iPad but my kids are always using the iPad so I just go the Library route these days for books. I am going to definitely make a “mommy” version of this pizza which translates to meat free and full of veggies! 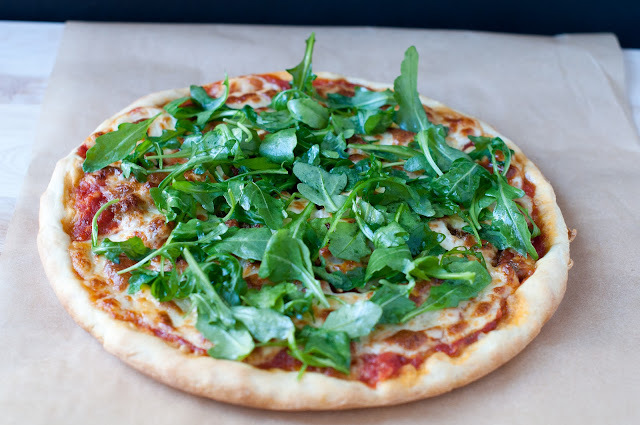 This looks like my ideal pizza—I just love the arugula tossed on at the end over all that melted cheese and sausage. My only concern with the skillet is whether the crust would stick to the pan, I don’t have good luck with cast iron no matter how well I grease it! The pizza looks fabulous… I love everything about it! 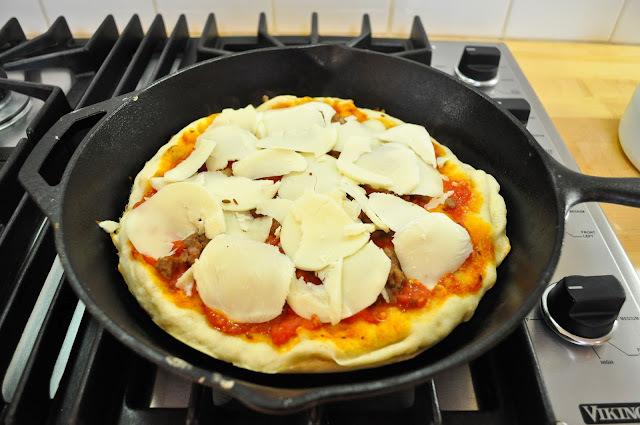 I make homemade pizza quite often, but have never made it in my cast iron skillet. It looks great! I will give it a try in the next week and let you know how it works out. Hi Annie! This was my first cast iron pizza experience as well. I usually use a rimmed baking sheet and bake up a rectangular pizza but my crust never got all brown and crispy and I hated the rolling out process. The cast iron skillet gets the pizza all brown and crispy on the bottom and edges. Let me know how it turns out for you!